More than 40 people have been duped in a scam involving online payments system PayPal, the Singapore Police Force (SPF) said on Tuesday (Jun 13). A 22-year-old infant care assistant who wanted to be an Islamic State (IS) “martyr’s widow” has become the first female to be detained in Singapore for becoming radicalised, said the Ministry of Home Affairs (MHA) on Monday (June 12). NutraIngredients-Asia is delighted to announce that the first Asia edition of the global probiotics and prebiotics summit, Probiota, will be held in Singapore in Octorber. Grab on Monday (Jun 12) announced it will extend personal accident insurance coverage to all passengers who use its carpooling service, GrabHitch, at no cost. Singapore Telecommunications Ltd (SNGNF) has ended in the black for consecutive sessions, indicating strong upward momentum. In taking a look at recent performance, we can see that shares have moved 1.49% over the past week, 1.87% over the past 4-weeks, -13.33% over the past half year and 6.56% over the past full year. HOMEGROWN bus manufacturer SC Auto is setting up a S$30 million facility in Yangon, Myanmar – its first foray overseas after focusing on operations here for over 20 years. Scottish engineering firm Weir Group has announced it is buying a leading Singapore-based oil and gas technology provider for $114m (£89m) in cash. Singapore and Beijing can cooperate to add value to China’s Belt and Road Initiative (BRI), which the Republic strongly supports, said Minister for Foreign Affairs Vivian Balakrishnan in an interview with China Daily published yesterday. Below is an excerpt from the interview with Dr Balakrishnan, who was on a two-day official visit to China. Maximus Asia, the second employment agency from overseas that is tasked to help unemployed white-collar workers with their job search, opened its doors at Westgate Tower in Jurong yesterday. About S$180 million in Medisave top-ups will be disbursed to eligible seniors this year, as part of the Pioneer Generation Package (PGP), the Ministry of Finance (MOF) announced on Monday (Jun 12). Up to 72 patients at the National Dental Centre Singapore (NDCS) received treatment with instruments that were not fully sterilised, the centre said on Monday (June 12) in response to media queries. Could Singapore’s economy be on a downturn again? Singapore’s economic outlook for this current quarter is on the downside after the soft patch in Q1. According to a report from Deutsche Bank, economic growth could again decline due because of a low base on imports. HOMEGROWN property agencies PropNex Realty and Dennis Wee Group (DWG) have agreed to merge – a move that will see the combined entity become Singapore’s largest real estate agency with close to 7,000 salespeople. SINGAPORE and China will do their best to expedite talks on the Regional Comprehensive Economic Partnership (RCEP), Singapore’s foreign minister said, calling the potential pact a statement on the importance of free trade. 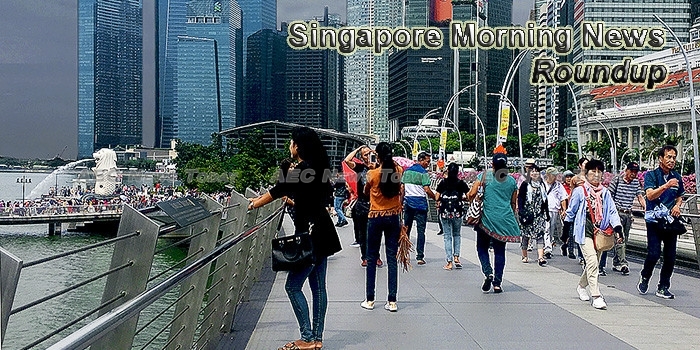 THE hiring pace is likely to slow down in the next three months in Singapore – the weakest outlook in eight years, based on the employment outlook survey by ManpowerGroup released on Monday. The illegal worker situation at Geylang Serai Bazaar has improved in the last few years, the advisor to the bazaar’s organising committee, Associate Professor Fatimah Lateef, said. The proposal to raise the minimum legal age for smoking in Singapore, as well as prohibit the purchase, use and possession of vaporisers and e-cigarettes will be up for public consultation from Tuesday (Jun 13). Senior citizens and people with disabilities are more likely to have better quality of life if they engaged in a social activity or sports, according to a study by the National Council of Social Service. Bedrock is adding a Zurich office to those in Geneva, London and Monaco. The newest Swiss office will be run by a well-known Swiss private banker who began his career at Pictet in Singapore.